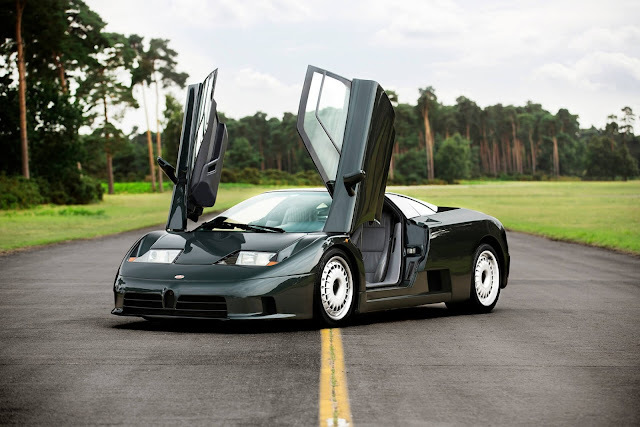 One of the 1990’s greatest supercars, the Bugatti EB110 GT delivered a carbon fibre frame, 560 bhp and four-wheel drive. 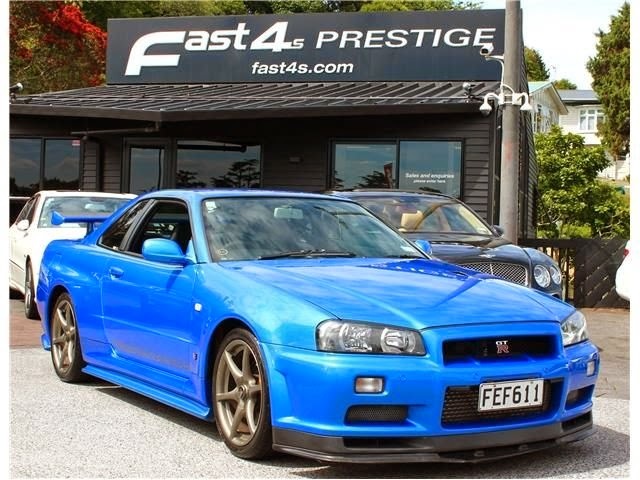 This was the first truly useable mid-engine supercar of the 90’s, the 3.5 litre, quad-turbo charged, V12 engine and six-speed manual gearbox worked with the driver, inspiring confidence and allowing the pilot to quickly approach the cars top speed of 213 mph. The EB110 GT was unveiled exactly 110 years after Ettore Bugatti’s birth, on the 15th September 1991 in front of the Grande Arche de la Défense in Paris. 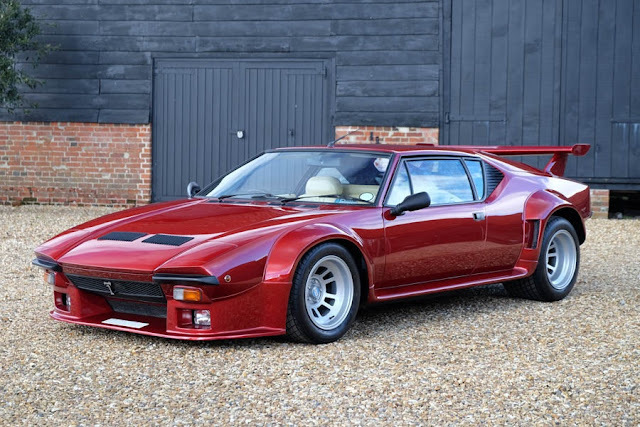 With its signature Gandini scissor doors, the car was very well received by all who were fortunate enough to attend the unveiling, and orders were quickly received. The first car was delivered on 1st December 1992 to Franz Wassmer in Switzerland. Early in 1994 Formula One driver Michael Schumacher purchased a yellow EB 110 SS, keeping the car until 2003. Also in 1994, Bugatti entered an EB110 SS in the GT1 field at the famed Le Mans 24 Hours race where it showed immediate pace. The car was driven by 1993 Le Mans winner, Eric Hélary, Alain Cudini and Jean-Christophe Boullion, a strong combination of both youth and experience. Hélary qualified the Bugatti 5th in class, although sadly the car was hampered in the race with a damaged fuel tank. In 1995, the Monaco Racing Team entered another EB110 in the Watkins Glen 3 Hour, Sears Point and Suzuka 1000 KM races. In 1996 the same car entered the Daytona 24 Hours, being driven by Derek Hill, son of American Formula One Champion Phil Hill. With this car, Bugatti was pushing the technological envelope, it designed and built a 60-valve, quad-turbo, V12 engine which was mated to a four-wheel drive system via a six-speed manual gearbox. 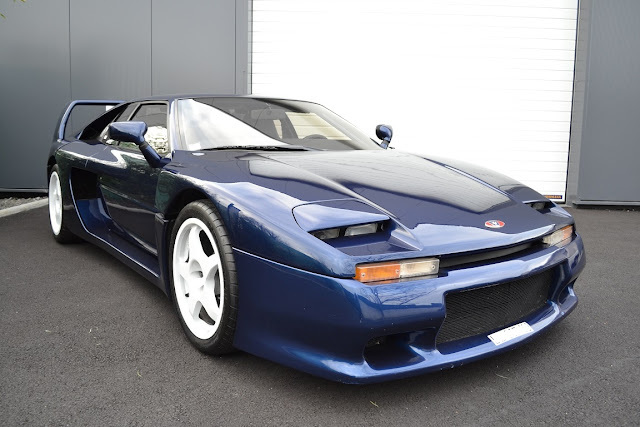 On paper, the EB110 GT was far more technologically advance than any other mid-1990’s supercar. Sadly, as a result of this technological approach, within three years of the first car being delivered, Bugatti Automobili S.p.A declared bankruptcy. Hard times hit the company in 1995, as result of chairman Artioli's over-ambitious purchase of Lotus in addition to the company's quest to develop the EB112 four door car, proving to be too much for the company. This Bugatti EB110 GT entered assembly at the Campogalliano factory on 17th April 1993, with factory testing commencing on 7th May and completed production on 11th May. This car was delivered new to Mr Polhman, a resident in Germany, fitted with a temporary license plate ‘M-063683’, being registered in Germany two days later. The car was finished in the very-rare colours of Verde Scuro Metalizzato with grey leather interior, one of only 8 cars finished in this combination. By December 1994, this EB110 GT was serviced, having covered 10,000 KMs. Less than 18 months later, in June 1996, this car was serviced again, this time displaying 19,800 KMs, clearly this was a car being driven and enjoyed! In the late 1990’s, this EB110 was displayed at the Essen Motorshow, by which time the car was displaying Germany license plate ‘HNC 0551’. The car passed through Austria before joining a prominent collection in Northern Italy. In 2014 this EB110 GT changed ownership, again forming part of a collection which includes a Ford GT, Ferrari 365 GTC and 365 GTB/4 Daytona. In July 2014, the owner brought this car to the UK where it was MOT’d, displaying 24,694 KMs and registered with the license plate ‘K174 KOO’. Today the car is presented having been fully detailed and still displaying less than 25,000 kms. Unfortunately, the EB110 GT was not born into the greatest economic climate, ultimately leading to the bankruptcy of Bugatti. However, the car is well appreciated as the most useable of all 1990’s supercars, offering comfort, presence and staggering performance. A hero of the 1990’s supercar pin-up generation!